I’m starting to get caught in the evenings with the light fading (there’s no floodlights in the arena). Sunset happens really fast here, compared to at home where the sun lingers on the horizon for ages. I think it’s a combination of being closer to the equator and also the mountainous landscape around us – the sun slips behind the Lubéron Massif just before 5pm, at the moment, and darkness settles in very quickly. With this in mind, I decided to limit myself to a strict thirty minutes with Flurry, so that I’d have plenty of daylight to work with Aero. Flurry is definitely improving! 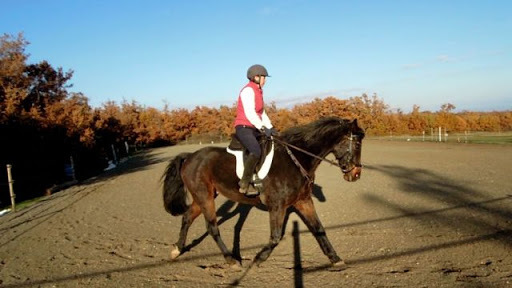 Anyone who’s seen me riding him knows that our canter transition is weak – his head invariably comes up and his back hollows, but on Monday we did a couple of transitions where he stayed round and I could actually feel his back come up and his hind leg stepping underneath him. We also did a teeny bit of counter-canter, I think that’s something else we can work on by ourselves, and some leg-yielding. I need eyes on the ground for the lateral work, because my sense of feel is pretty rubbish, but I might set up my camera and video our leg-yielding and shoulder-in next time. Anyway, being super-cautious, I led him around the arena twice on each rein before mounting. He seemed ok, alert but not jumpy… I mounted and we walked around a few more times, he was very settled, lazy, even! We proceeded to work… and it got better and better. I was trying to remember what I had learned with Frank in Skevanish back in June – ask him to go forward and keep offering little alternate gives on the reins, which encourages him to soften and work into the contact. Apart from losing my balance once or twice early on, I was able to stay with his bouncy trot and offer him a contact he could trust. We did walk/trot circles, serpentines, leg-yielding, shoulder-in (not sure I had the angle right, sigh…), then a couple of canters, with circles and transitions. Good points : we finished off as good as I’ve felt on him, he was working into a steady contact, upward transitions were seamless, leg-yielding was all good, shoulder-in to the left was good. A couple of times, the trot work felt so fluid, I was tempted to try sitting trot, but I didn’t. He concentrated throughout and felt really willing! Bad points : every so often we did a really crap, abrupt downward transition. That’s something I need to figure out – using more leg on downward transitions, especially trot/walk. Similarly, sometimes we did a transition instead of a half-halt – again, probably because I wasn’t using enough leg. I let my reins get to long from time to time – I do this on both horses, and it’s something I keep nagging myself about. Shoulder-in to the right wasn’t great and occasionally he lost inside bend on a right-hand circle, although that’s something that had improved by the end. I met Alexandrine as I was leaving and had a chat. She’s going to get the Ostéopath to call and check him out – I’m quite sure he/she will find a few things wrong – and we’ve also tentatively arranged a lesson for next Monday. I needed to have an easy day on Tuesday, as I wasn’t feeling great – another migraine (can’t figure out what’s causing them, usually I can identify a trigger). I decided to give Flurry a day off, and I think Flurry actually wanted a day off, too! Normally, he’s waiting at the gate as soon as he sees me coming, but on Tuesday, he kept his distance, and Aero was the one who was waiting at the gate. My plan for Aero was a walk in hand, around the short, half-hour loop. He was tense leaving the farm, and stopped a couple of times, staring anxiously into the distance. I let him look for a moment each time, and then asked him to walk on again, which he did. Half-way through the spooky forest – I’m quite certain there are deer and wild boar living there, there are lots of tracks in the mud – he settled, his head came down, he stretched out his neck and he strode along beside/behind me, depending on how wide the trail was. He stayed like that, relaxed but energetic, eyes soft and ears attentive, for the rest of the walk, even as we walked along the road beside his paddock, where Flurry neighed at him and came trotting down to the fence. This was a huge improvement on the last time we walked that route, where he behaved himself but was tense throughout, with his head up, eyes and ears ever alert, and walking so fast that he took a good five minutes off Flurry’s time for the same route! He was a bit of a prat while I was grooming him, he kept turning around and was quite bargey about it, so I ended up giving him a sharp thump and growling at him the next time he tried it. It worked, but he seemed a bit worried in general – the only thing I could see that might be bothering him was a van parked down by the house – not much of an excuse, really, for a horse that’s been there, done that and got all the personalised numnahs. Being the cautious soul I am, I decided that I’d walk him around the arena twice in each direction before mounting – with the thought in my head that if he was really fresh I could free-lunge him again! He improved throughout the session, and I’m actually quite disappointed that I didn’t get more of it on the video. I was expecting the bits I could see from the first nine minutes to be pretty crap, but I was pleasantly surprised, we didn’t look half as bad as I feared. MC rang me to say that she could hack with us over the weekend. This gave me the incentive to sort out Flurry’s boots. After all the rain and the mud, his feet have softened somewhat, and I’m quite certain he needs his front boots at the moment, although I was hoping we would get away without hind boots. He was sliding a lot in his Renegades the last time, which I put down to their very worn treads, so I felt I really had to give the Cavallo Sportboots a good test. They seemed to be fine, he felt pretty confident and sure-footed in them and they didn’t shift or rotate on his hooves at all. The only problem was that he had a couple of “ouch” moments with his hind feet – enough to make me decide that he needs hind boots as well, at the moment, which could be problematic – he used to be a size 2W behind, and I don’t have a spare pair that size. I tried his very worn Renegade size 2WW front boots on his hind feet when we got back. His feet must have grown and spread quite a bit, because the size 2WW fit just fine – Yippee! I had to adjust the cables a little, but that only took a few minutes. While I was doing that, I thought back to the first time I tried to adjust the cables on a Renegade boot – it took me ages! I’m a whizz at it now! Just as I was finishing up, MC arrived with Pietro, having ridden up from Reillanne. We chatted a while, then I said I would put Flurry out and give Aero a quick lunge – it was well after 4pm by now, and it gets dark at five. Aero was quite relaxed, and I started free-lunging him in the round pen. He was attentive and obedient – until MC led Pietro past and then came over to watch for a few minutes. He got more and more wound up, as did Pietro and indeed the four horses in the paddock across the laneway. Aero was prancing around the round pen, head up, tail up, blowing out explosive snorts, trotting with the highest knee action I’ve ever seen and not paying the slightest bit of attention to me. I watched in open-mouthed disbelief as he launched himself into the air. No, he didn’t clear it, he broke the top strand, pecked as he landed on the stony surface outside the round pen and galloped back to Flurry and safety. It’s probably four years since this horse jumped anything, but you wouldn’t think that to watch him take on the fence, and the second highest strand, which he left undamaged, is probably close on 1.2 metres – almost four feet. MC was aghast and apologised profusely. 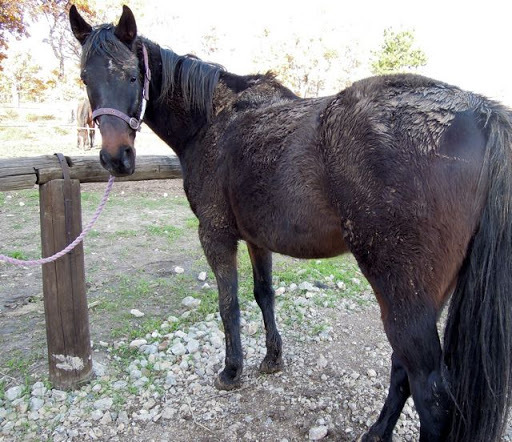 How do you say it’s not your fault my horse is an idiot? I found him standing outside the gate to his paddock, nose to nose with Flurry, who I have to say was exuding nothing but calmness and mild curiosity. I caught him easily and told him he had to go back to the round pen for another five minutes. On the way, we stopped and he and Pietro introduced themselves – all very calm, no squealing or hysteria. Back in the round pen, he was sound (thankfully!) and a bit more attentive. He did make one more approach to the fence – my heart nearly stopped – but chickened out (I had re-tied the top strand, fortunately). Hah–what a silly boy, leaping to be with Flurry!Yes, those dark nights sneak up on us fast, don't they? Got to be out of the woods and off the roads by 4:30 to be safe. It gets dark here at 5:00 as well — suddenly dark. I notice that when we travel north the daylight lingers much later. I think we are about even with Provence in terms of distance from the equator.